100 gallon tank). My question is really about refugium. I found a hob one. It comes in 3 sizes. But I was interested in the medium ( 3.60 gallons 19" L x 4.5" w x 12"t) vs. the large (4.70 gallons 25.5 l x 4.5" w x 12" t). I was told to go bigger and not sure if the 60 gallon tank could hold such weight and also was told that both refugiums there (CPR AquaFuge 2) would be too small for my tank. Any information would be greatly appreciated. <Well; your gear and set up ideas will work. The larger the refugium (of any kind) the better; but ANY is of great utility. Oh, and not to worry re the weight of the unit of whatever size you settle on being too much. that will have a 4" live sand bed or miracle mud with Chaetomorpha and some Liverock rubble. if i take this approach what would be a good plan of attack being that introducing newly added live rock and live sand to the system. i assume that making sure the live sand and live rock are already fully cured from my lfs would be best as they sell them already established in holding tanks. any input to this would be deeply appreciated. last but not least what if i were to eliminate the Fluval totally and just keep the skimmer and live rock/sand giving the tank numerous water changes let's say 5 gallons every 2 to 3 days? I have a 55 gal. reef tank that currently has three fish. Percula Clown, Yellow Watchman Goby, and very shy Four-Stripe Damsel. I have debated added a 'Scooter Blenny' or Mandarin Dragonet. I know that my Amphipod population is huge and my Copepod population is also incredible; but, it needs to be bigger for the Mandarin. 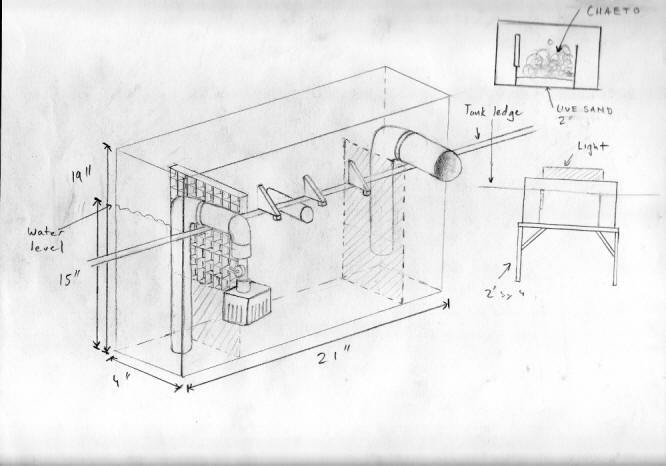 I want to do something outside the box for a refugium. I was thinking about taking a large cheap filter; removing the media; adding some large crushed coral and some small rock rubble to it. Would this work for growing a ton of Pods? I cant really be drilling holes into the tank for a sump so I was trying to avoid that completely. I want to move everything to a 300 gallon tank in a few years and I would like to experiment before trying to go with something so large. Would you recommend something different that doesn't involve drilling holes, or having a bucket attached to the tank? I am not worried about growing any algae I just want to increase my pod populations to have a mandarin. Thanks and enjoy your weekend, or at least whats left of it. Hi, I have a 46 gallon bow front soft coral reef. I have been reading on your site about how you need protein skimmers in a reef tank. The problem is the tank is built into my wall so I can't use a skimmer. I have been looking around and found hang on back refugiums/w protein skimmers. Would this be a good compromise? Also how big should it be for my tank? Thanks, I meant if a hang on back regium would replace a sump my bad on that. So would a hob regium be a good compromise for a sump? Searched this and couldn't find a definitive answer so here goes! I have a standard 6', 125 gallon AGA. My fears are probably unfounded, but I was wondering is a HOB 4 gallon refugium and 2 Aqua C Remora Pros too much weight, evenly spaced, across the back of the tank? Thanks in advance for your answers and time, I truly treasure this website and look forward to reading it's contents daily. I have a 55gal SW tank, currently it has 40ish lbs crushed coral substrate and maybe 30 lbs LR left in it. I have been using it as a quarantine tank for my 120 for about the past 2 years. Unfortunately I have run our of space in the 120 FOWLR and I no longer have use for the 55 gal as a quarantine tank, I plan on cleaning out my 30 gal hospital tank if I can't help but jam that last little fish in the 120 that ruins the whole thing, just kidding. I want to put in a pair or two of Reidi seahorses into the tank and maybe some mushrooms and Zoas. That being said I have read that seahorses are partial to copepods and amphipods, I plan on feeding them frozen mysis but every little bit helps. 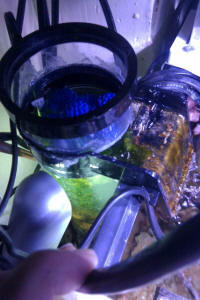 JBJ UV filter, and a Corallife super skimmer. Background done now on to questions. 1) So I was thinking of the octopus HOB fuge 24". It will have to straddle the center brace so I will have to call the manufacture for exact measurements. Will that be large enough to make food for the tank (unfortunately there is nothing bigger)? Or would it be a waste of money? I saw that most of you guys said in their replies that the larger the better, but 20% of tank volume is a minimum for food production, the 24" is only about 10%. 2) Also what would be the ideal substrate for food production, I'm not too worried about nitrates so I want to get the most food out of it that I can. 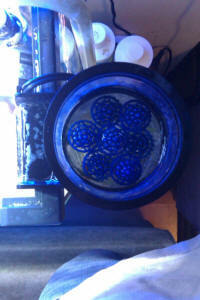 3) I was leaning toward a 1000h reef octopus skimmer as well. I have heard nothing but good things about that company. Any suggestions regarding their HOB refugium? Or should I go with CPR's version with the black back (I will be buying their light system)? 4) I know this is mostly about the fuge and I hate to mess up the good system you guys have going but what do you think about the seahorses. I plan on getting them from seahorsesource.com as all theirs are tank raised at the least. They say that 2 pairs of just about any seahorses is fine in my size tank and they are reef safe. The Reidi are commonly found on stony corals in the wild so I'm assuming they will be ok with the flow for soft corals. Any input would be welcomed. I've ordered a small Aquafuge HOB refugium and I am kind of confused as to what to put on it for lighting. I was thinking maybe a JBJ Macro Glo 25 watt CF for lighting but 10 watts-per-gallon seems like overkill to me...so should I get the 15 watt instead? The fixtures that are designed for the Aquafuge cost more than these and I like to save money when I can. I also have a spare JBJ Picotope light...would this work? If the JBJ light doesn't work, what lighting fixtures would you recommend? 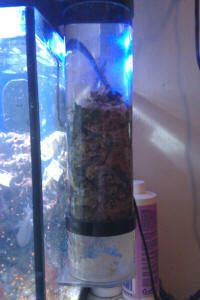 I got a few saltwater refugium questions today and Ill try and make them short for you. I have a 26 gallon bow front reef tank that I'm considering putting a h.o.b refugium on it. If I do so, then what exactly do I need to put in it for copepods and amphipod population? What kind of macroalgae would be best, meaning easy to care for and just help my tank overall and help with some hair algae in my tank? Once in there do I let the macroalgae grow wild or keep it small and trimmed? Also right now I am just running a hob filter with just carbon filter pad in it and a Deltec 300 skimmer on my tank. If I add the refuge do these need to stay on my display tank (I think the skimmer does?) or can they be hung on the back of the refuge I'm putting on? Six months ago I decided to add a HOB refugium to my display tank. The purpose of this refugium was to grow copepods for my mandarin couple. The refugium is about 2.5G and contains macroalgae, live rock and sand. There is no specific lightning system as it benefits from the main tank lighting. For two months I've noticed that some parts of the sand were getting a crappy look, like a mix of black and white mould. I have no idea where that comes from. Set-up problem ? Now I'm wondering if I should remove the whole sand from the refugium ? Wouldn't it affect copepods growth ? Re: NNR and Hang on Tank Refugium 3/5/07 What a great reply. Thanks. So should I even bother with the hang on? <I would not... too small, not a great savings in terms of what one can make themself...> You recommend a refugium that's 20% to 40% of the tank capacity. But that was for food production. <Mmm, not alone, no. Many benefits... that accrue with size> Do you recommend the same capacities for NNR? <Yes. Bob Fenner> By the way, Bob, I haven't gotten the Monty Python response in year. Excellent recall. <Heeee! "Is that an African or English Sparrow?" BobF> What have the Romans done for us anyhow? Refugium selection Hello guys, >>Hello Frank. Marina here. 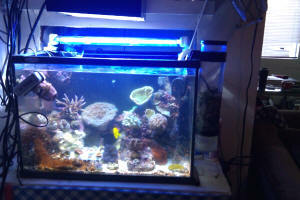 I have a 55 gallon reef tank , 4 inches live sand 90 lbs LR, CPR BakPak2, 260 watts pc lighting. 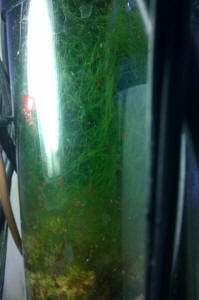 All is well, I have been keeping a small bunch of Chaetomorpha in the corner of the tank an am getting of pruning it. 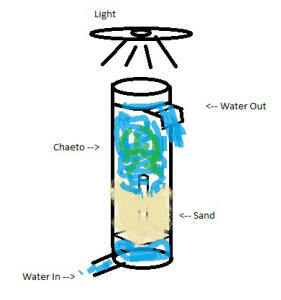 So I figured a CPR refugium. There are three sizes to consider. I am not poor, but I am thrifty and try to save money where I can, possible. Should I get the biggest one? Is it really worth putting a sand bed in it, or should I just get one that will accommodate my macro and my heater? I have no nitrates in the aquarium (at least undetectable) so the present amount of algae is working, is there any other advantage of getting the largest one other than sand bed? Thanks. >>Well, truth be told I'm an advocate of going bigger when you can, especially in terms of filtration. Yes, in my opinion the sand bed is worth it, especially if you currently have or may be getting any filter feeding critters, or other animals that will appreciate the microfaunal ("pod") growth for feed. >>If you get the largest size you'll have room for upgrades in the future, including any stock additions. Having that extra room for any unforeseen disasters is ALWAYS a plus in my book, too. If you just don't want to go for the biggest one they're offering, then consider just going one size up to give that extra breathing room. I think you'll be more glad that you did that in the long run.